Published: Sep 17, 2018 · Modified: Apr 11, 2019 · By Jen Sobjack · This post may contain affiliate links. A basic Sour Cream Pound Cake that is just like grandma used to make! Top it with whipped cream and fresh berries for a taste of nostalgia. 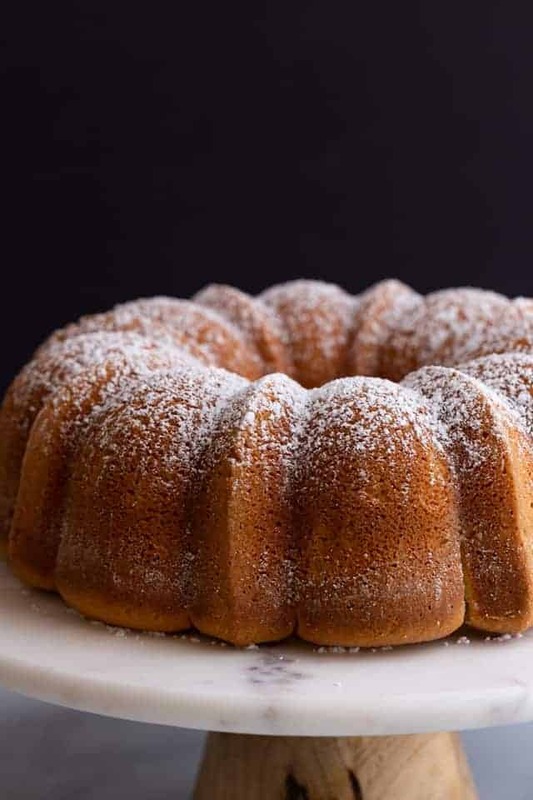 This moist pound cake recipe is one of the best you’ll try. It’s made just like the traditional version only replacing half the butter for sour cream. This yields a softer and moister cake texture. I’ve made a number of pound cakes including peach pound cake, orange pound cake, and honey bun pound cake. But, I do believe today’s recipe is the simplest one with the best texture and flavor. It’s even better when you top it with homemade whipped cream and fresh berries. Vanilla ice cream with a drizzle of caramel sauce is also a great way to enjoy this cake! 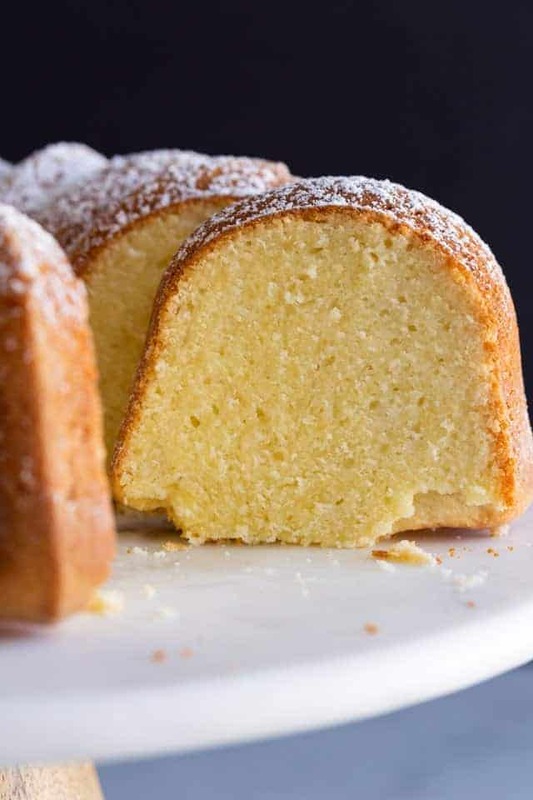 Pound cake gets it name because it uses a pound of each ingredient. Traditional pound cake contains 1 pound of butter, 1 pound of sugar, 1 pound of eggs, and 1 pound of flour. Sour cream pound cake contains 1/2 pound of butter, 1/2 pound of sour cream, 1 pound of each of the remaining ingredients. What does sour cream pound cake taste like? Sour cream pound cake is rich yet incredibly tender and moist. It reminds me of my basic vanilla cake but it’s so much more flavorful and decadent. Butter – Unsalted sweet cream butter works best here. Sour cream – Use full-fat sour cream for the best results. Sugar – White granulated sugar is traditionally used but I bet brown sugar would taste amazing also! Eggs – You need roughly 9 large eggs to equal a pound of eggs. You will taste the egginess because of how many eggs are used so be sure to reach for the freshest eggs you can find. Cake flour – I love the soft, tight crumb that cake flour has to offer. Sift the flour a couple time after weighing it for a supremely tender cake. How to make sour cream pound cake from scratch? Cream the butter and sugar together until it’s super light and fluffy. The color should look pale and the mixture should be close to double in volume. This is when you know you have perfectly creamed butter and sugar. Mix the eggs in one at a time, making sure to fully incorporate each addition of egg before adding the next one. This allows more air to be added to the eggs which will help the cake rise. Beat in the vanilla and salt after all the eggs have been well incorporated. Next, mix in the flour, alternating with the sour cream. I like to add half the flour, then all the sour cream, then the last of the flour. You’ll want to mix just until the flour is fully mixed in but be careful to not overmix. You need a 12-cup bundt pan for all the batter. And make sure you grease and flour the pan well before adding the batter. I’m a huge fan of baking sprays that contain flour. Just pray it in and use a brush to work it into the all the crevices. The cake needs to bake for a good 70-75 minutes but start checking it about 10-15 minutes sooner. Oven temperatures vary and yours may run hotter or cooler than mine. Test to see if the cake is done by sticking a toothpick in the middle and if it comes out with only a few moist crumbs attached, it’s ready to come out. Cool the cake in the pan for about 10 minutes then invert it onto a wire rack and allow it to cool completely before slicing. This can take about 40-60 minutes. I like to serve sour cream pound cake with whipped cream and berries but it’s also great with a scoop of ice cream. However you serve it, I’m certain you will love the texture of this classic recipe! How long can you keep sour cream pound cake? 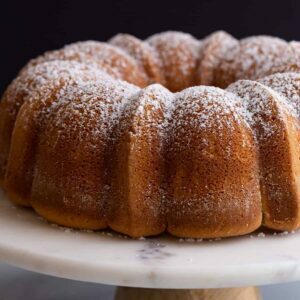 This pound cake will keep for up to 4 days stored at room temperature or for up to 1 week stored in the refrigerator. Wrap it tightly with plastic wrap or place it in a cake keep to prevent it from drying out. Weigh your ingredients. The success of the recipe depends on using accurate measurements. Take your time mixing the butter and sugar together. Let it beat for a good 10 minutes to ensure it’s as light and fluffy as it can get. Also, don’t rush adding the eggs. Drop them in one at a time and mix very well after each addition. Preheat the oven to 325°F. Grease a 12-cup bundt pan and dust with flour, tapping out any excess; set aside. Beat in the eggs, one at a time, mixing well after each addition. Then beat in the vanilla and salt. Add half the flour and mix just until combined, about 1 minute. Add the sour cream and mix until combined, about 1 minute. Add the remaining flour and mix until just combined, about 1 minute. Transfer the batter to the prepared pan and bake for 70-75 minutes, until a toothpick inserted into the center comes out with only a few moist crumbs attached. Cool the cake in the pan for 10 minutes then invert it onto a wire rack to cool completely. 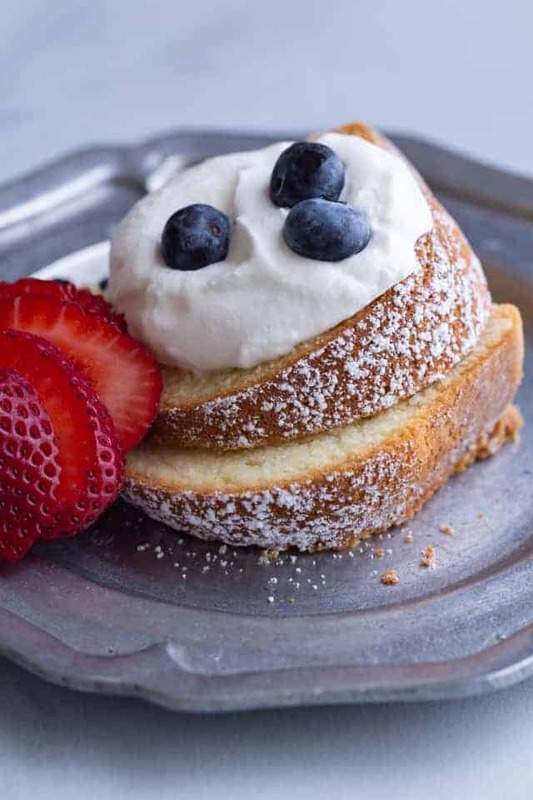 Serve with a dusting of powdered sugar or whipped cream and fresh berries if desired. The cake will keep for up to 4 days wrapped tightly and stored at room temperature or for up to 1 week stored in the refrigerator. The cake can also be frozen for up to 3 months. Thaw in the refrigerator overnight. Thanks for the recipe. I baked the cake an hour ago,I am trying it right now and it is delicious, very moist, this recipe is a keeper. Yay! So glad you loved the recipe!